Racquet Sports Center aims to be the hub for all information about racquet sports. We provide unbiased reviews so that you can find the right equipment for you. 3 Who is the Wilson Burn 95 ESP Tennis Racquet ideal for? The Wilson Burn 95 racket is a great tennis racquet which I would recommend to all players especially if you’re new to the sport. It’s a well-balanced racket that gives you power and strength combined with control. Overall: If you're looking for a daily racquet that has power and doesn't hurt your joints, the Burn 95 is it. The racket has a conventional look to it and a standard grip. It’s comfortable to hold and stays in the hand well even towards the end of a hard game. The head and length are designed to give players control vs power on the ball and from the ground up the Wilson Burn is designed to be comfortable. Testing out the Wilson Burn racquet against a ball machine. The main point I look at when considering a new racket is how it feels when you hit the ball and this one stands up well in that regard. The weight and how it fits in your hand means that it’s easy to feel the stroke as you make it. The frame of the Wilson Burn 95 racket is made from high performance carbon fiber which means it is light yet strong. This enables you to get power into your shots while not being too heavy to use. One of the things about the Wilson Burn racquet that instantly stood out to me while playing, was the sheer level of comfort that this racquet provided. I had been having slight shoulder issues before practice but picking up and playing with this racquet, I barely noticed them. If you ask most tennis players, they will tell you that accuracy is the most important things to them. After all, you can hit the ball as hard as you want but if it goes out every time what’s the point? This where the Wilson Burn tennis racquet shows it’s prowess. The design gives you all the feel you need to put the ball exactly where you want to. 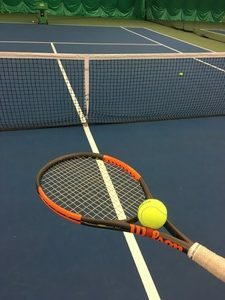 I typically play as an aggressive baseliner and the Burn 95 tennis racquet was able to easily control the power from my shots and help me direct the tennis ball easily. 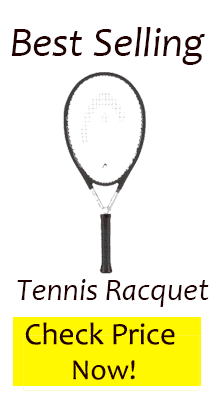 Most tennis rackets are one of two shapes – either round or elliptical. The shape of a racket directly affects how it performs out on court with rounder rackets leading to better control while elliptical rackets give more power. The shape of the Wilson Burn 95 falls somewhere in the middle and explains why it gives a nice mix between power and accuracy. The head size of the Wilson Burn 95 comes in at 95 inches. Some players may consider this a little small but I actually find it an advantage. The smaller size head gives you improved precision in placing your strokes. 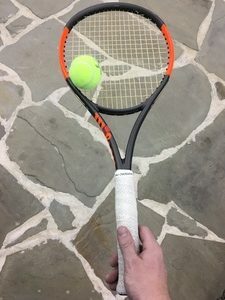 It’s common to go for a larger head to gain more power but by going with a racket like the Wilson Burn 95 you will have greater control in your play. The length of this tennis racket is 27.25 inches. As with the head size, this is towards the smaller end of the market but shouldn’t count against it. The smaller length gives it extra punch and that combined with the feel it gives you make for a great racket to play with. It must also be noted that there is ample room on the neck for both hand when making double-handed strokes. The Wilson Burn 95 is made of carbon fiber and weighs in at 11.8 ounces. This leaves it fairly in the middle of the weight range in comparison to other rackets. This is good as any heavier and I think you would lose the unique feel which wouldn’t be worth it for the extra power gained. The balance is 13 inches / 5 pts Head Light for this particular racket. The Wilson Burn 95 Racket features 16 strings vertical x 20 strings horizontal. As with the other features of this racket this makes it well rounded and makes the ball easy to hit. The pattern makes it very responsive and allows for certain amounts of spin to be easily put on shots. I couldn’t find any drawbacks with this string / pattern set up and think it is just about right as it is. Who is the Wilson Burn 95 ESP Tennis Racquet ideal for? With a small head size, well-designed frame, and a slightly heavier weight, the Wilson Burn tennis racquet should be aimed at beginner to high intermediate players. Beginners should get a version with a larger head size such as the Wilson Burn 105 as that’ll enable them to hit the ball easier and provide more power. 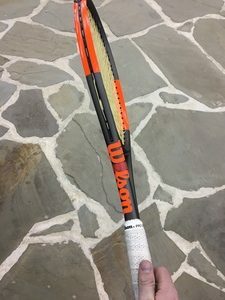 For the intermediate players who are interested in this racquet, I would highly recommend it. At this level you’re likely playing tennis daily or weekly and it’s very important that you feel comfortable with your racquet. The Wilson Burn 95 provides that comfort allowing you to stay out on the court longer and compete. Between the Burn and Blade which do you prefer? I play weekly now (in my mid 40’s) and never played higher than high school level. Planning to demo both but each seem to come with varying weights, head light options etc. and it’s almost overwhelming. Hi, from personal experience I love the Wilson Blade! That was my first “real” tennis racquet as I started to take the sport more seriously and I’ll always have a soft spot for it.